Every once in a while, my family makes boiled peanuts for snacking. We don't do much, boil fresh peanuts until they soften, then lightly salt them. I thought it was just a Vietnamese thing until my freshman year of college. It was spring break and I was driving down to Mississippi with a group of other volunteers to build houses for Habitat for Humanity. We stopped off at a gas station and inside they sold boiled peanuts. Who knew it was a Southern American thing too? Here's one of the funny things about the differences between Vietnamese dialects. 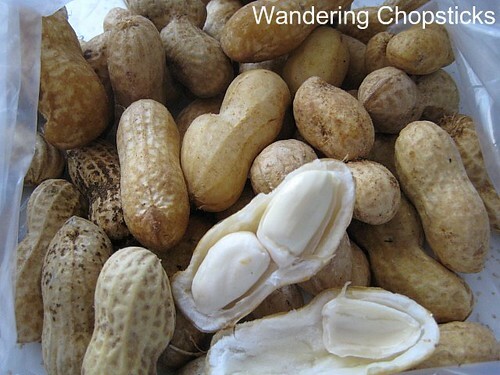 For Southerners, peanuts are called dau phong. Northerners call peanuts cu lac. Well, lac is also the word for lost. "Lac duong" = lost your way. But you can't say "dau phong duong" = peanut your way? Heh. OK, bad joke. Only another Vietnamese would get that. 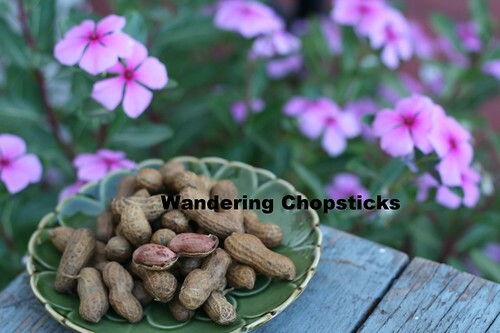 Shelled boiled peanuts are also used in Chinese cooking for an appetizer with celery and tofu like at Luscious Dumplings Inc. - San Gabriel or to steam with poultry like at Seafood Village - Temple City. 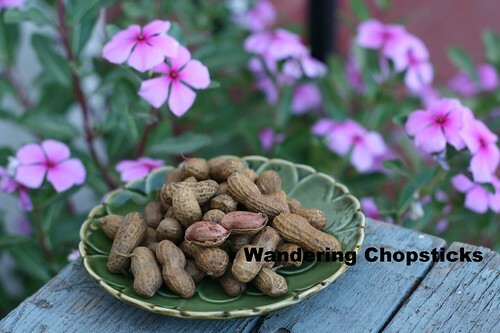 Raw peanuts, not the roasted and salted kind found in stores, come into season in the fall. I found mine at the Farmers' Market - Alhambra for $1 or so a pound? 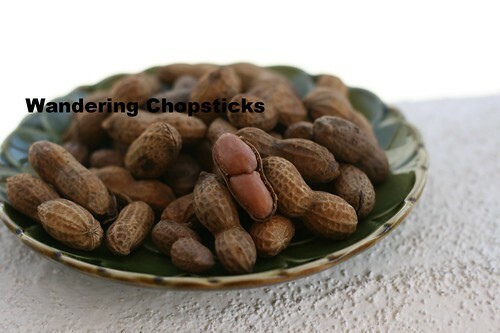 Did you know there's a technique to picking raw peanuts? While I was trying to figure out what to put in my bag, another lady was squeezing each one. She told me to make sure that you could feel the peanut inside its shell, otherwise it's either too small or hadn't formed yet. Lightly wash the peanuts and scrub if they're particularly muddy. Cover with water and soak overnight. 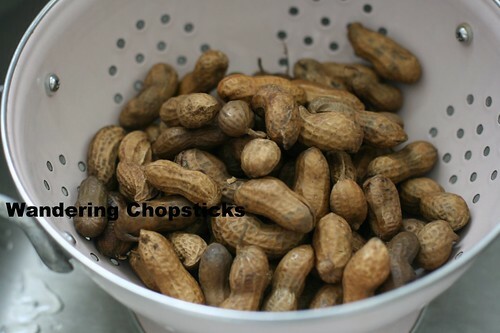 The next day, drain the peanuts and them to a pot, fill with water until the peanuts are covered. Add about 1 tblsp of salt per pound of peanuts. Bring to a boil and turn heat down to medium-low and let simmer for at least half an hour. 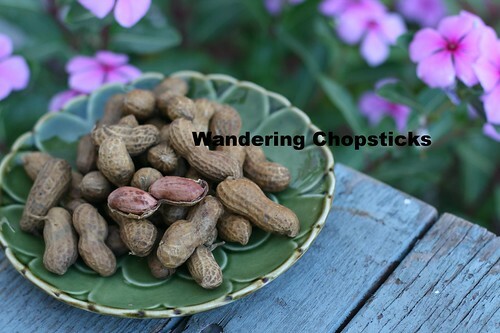 Eat a peanut and check to see if it's softened to your liking. If not, just keep simmering. An hour's simmer time is perfectly acceptable. Drain into a colander and rinse. Think of them as the Vietnamese version of edamame. 1 year ago today, Sour Cream Apple Pie. Oh wow...this is something I would never have thought of and didn't know it was a common snack in Vietnamese culture. Thanks for the education. For a true Southern version you'll need a lot more salt - a cup+ in a large stockpot - and you'll need to cook them for at least 6 hours. A cup+ of salt? That's insane. And 6 hours will make the peanuts mushy. No wonder Southern food has a reputation for being unhealthy. I'll stick with my version thanks. For some reason, raw peanuts that I bought from store here takes too long to boil. It took almost two hours of boiling. And it doesn't taste that good either. I tried two different times with two different stores, the same result. So I gave up and haven't cooked it again. I bought these fresh from the farmers' market, so maybe that's why? But most of the time, I'm lazy and buy a bag from the banh mi shops since it's only a few bucks.